From a Glassmen press release: This November will mark the third appearance of the Glassmen percussion section at the Percussive Arts Society International Convention (PASIC) in Columbus, Ohio. 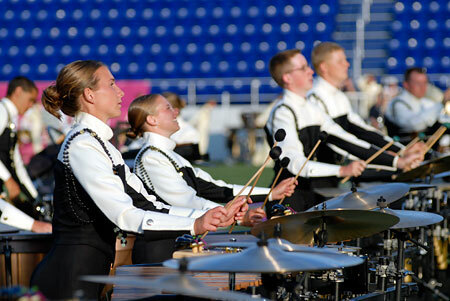 Glassmen front ensemble members perform in Annapolis, Md. in June, 2007. Joined by the members of the corps' 2007 front ensemble, Glassmen percussion instructor Rob Ferguson will present an educational clinic at 2 p.m. on Thursday, Nov. 1, titled "Amplifying the Front Ensemble: How to and How Much?" This clinic will be focused on the techniques for amplifying the outdoor percussion ensemble, and will provide practical applications for all educators. Learn more about this appearance on Glassmen.org.